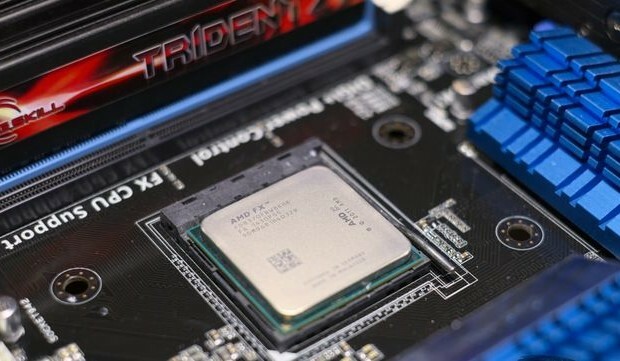 Frankly, the series processors AMD FX no longer looks like a living and somehow growing. Everything points to the fact that AMD has thrown its main efforts on the promotion of hybrid processors, each year developing for them a new architecture and platform, while the FX family for two years does not receive any basic updates. AMD’s lack of interest in its own processor FX series is very clearly illustrated by the fact that sold today members of this family are based on the sample design Vishera 2012, and therefore they continue to be produced on the technological process with a scary thought 32nm standards. It is not fresh blows, and with all platforms Socket AM3 +, for which AMD 990FX chipset offers come from 2011. In other words, until recently, it looked as if AMD has intended to curtail the sly series FX in its present form, and due to the withdrawal of the processors from the market to expand the area of far more successful hybrid Kaveri. 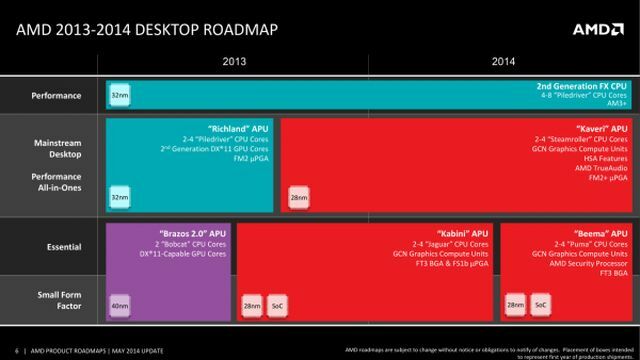 About the same and the official pointed out the company’s plans, which demonstrated the absence of any changes in the AMD FX processor line in this and probably next year. However, AMD is not among the producers clearly following his plans, and because it is able to surprise the sudden announcements of new products. Thus, in early September, the company suddenly released three fresh Processor Series FX. However, talking about the introduction of a productive modern AMD processors microarchitecture Steamroller still not talking. New products continue to be based on the design and old microarchitecture Vishera Piledriver. But the improvement of a 32-nm process technology has allowed AMD to make the next evolutionary steps: on the one hand, to improve the frequency potential, and on the other – to reduce power consumption. So, the market appeared eight-news FX-8370, FX-8370E and FX-8320E. The first processor of the trio is a conditionally flagship model with 125-watt TDP, and a pair of CPU with the letter E in the model number – this latter-day 95-watt eight-representatives Series AMD FX. Reduced power consumption for the FX series processors with eight cores seems to us not too interesting innovations. Such CPU still remain seriously more voracious than competing offers from Intel, which is limited TDP 88- or 84-watt framework. 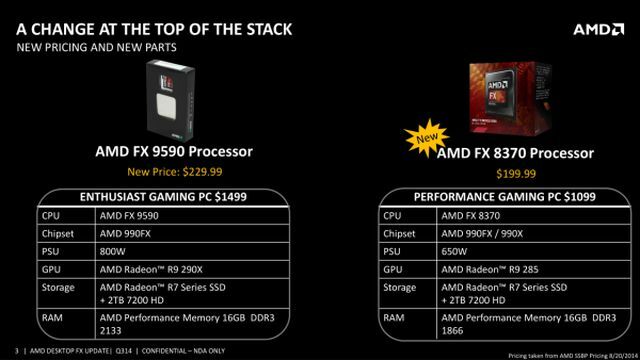 But the new FX-8370 – much more interesting newcomer. The fact is that recently AMD managed to significantly lower prices, and thus the CPU FX-8370 can be contrasted with the average Intel’s quad-series Core i5, that in view of his ability to overclock this chip makes a very attractive at first glance, option. AMD FX line of processors in its present form is crowned with two different versions of the flagship eight cores. Most flagship of them – FX-9590 processors and FX-9370 – different operating frequencies approaching the 5-GHz mark, but they have terrifying TDP of 220 watts. Unfortunately, these processors are very narrow in scope and are quite limited demand. Even despite the fact that in recent months seriously AMD lowered their prices by placing these processors from the category of fashion products with very disadvantageous from a rational point of view, the combination of value and performance in a number of competitors older Intel Core i5, the acquisition of FX-9590 and FX-9370 can be characterized not only as an adventurous decision. The fact that these 220-watt processors require specific motherboards and high-performance cooling systems, that is, forced to indulge in a lot of additional costs for creating a suitable environment for them. Therefore, fans of AMD products much more in demand flagship processors with a standard platform for Socket AM3 + TDP of 125 watts. Such vosmiyaderniki related to FX-8000 series, offer only a little beyond the 4-GHz line operating frequencies. But they are compatible with almost all motherboards equipped with Socket AM3 +, and do not require expensive coolers. Moreover, as any representatives AMD FX series are classified as Black Edition, they have a fully unlocked multiplier and a certain bit of luck can be overclocked to FX-9370 or even higher. Generally speaking, long available processors FX-8350 in the best of their ability cope with the role of a 125-watt flagship product line AMD. However, the FX processor and platform Socket AM3 + us apparently have to live at least another year and the next, so the marketing department of the company decided to create the appearance of movement forward and initiated the release of an updated version of vosmiyadernikov. But given the fact that no engineering works to improve its current high-performance microarchitecture AMD does not lead, relying on remote and mysterious fog covered microarchitecture Zen, today, expect some clear progress would be too optimistic. Therefore successor FX-8350 processor new FX-8370 – it’s only a small acceleration Vishera, legalized under passport characteristics. Thus, the announcement of the new FX-8370 processor primarily plays the role of emotional promise. AMD as it shows us that the Socket AM3 + platform is still alive, and the company continues to seriously consider it as an alternative to the current productive systems based on Intel’s processors Haswell. But if we ignore all this subjectivity and sober look at the specifications, the FX-8370 is unlikely to impress even the most loyal fans of AMD. Over the past from the output of FX-8350, the company was able to increase only by 100 MHz frequency in turbo mode, and a nominal frequency FX-8370 remained at the same 4-gigahertz level, which was its predecessor. At the same time the price of FX-8370 is set to $ 20 higher than the FX-8350, and it puts the demand for new items under some doubt – provided that the delivery model FX-8350 will be discontinued soon. But do not forget that between the FX-8370 and FX-8350 – a gap width of two years, during which time AMD together with its technology partner GlobalFoundries could easily achieve better performance coming off the assembly line 32-nm semiconductor crystals. And it is this, perhaps, the most interesting novelty today. Hopefully, the FX-8370, despite its modest specifications, able to please as a practical lower power consumption and better frequency potential during acceleration – all this we carefully check the test. However, we must understand that to make a candy of inappropriate source material is still impossible. And the FX-8370 – this is the case. First used in the production of processors AMD FX process with 32 nm – is, by the standards of microelectronics, not even yesterday and the day before yesterday. The same Intel used such production rates in 2011, and now it completes the transition to 14-nm technology with three-dimensional transistors. Second, the underlying Vishera Bulldozer microarchitecture derivative of Piledriver proven to be ineffective in most commonly used tasks, and this is recognized even in the AMD. And thirdly, Socket AM3 + platform as a whole lacks many modern features. For example, there is no protocol support PCI Express 3.0, bus USB 3.0 and SATA Express interfaces and M.2. Does it make sense with all this in the construction of modern personal computer to bet on processors like the FX-8370? If you allow yourself to positive answer to this question, let’s look at the comparative characteristics of all the available arsenal of eight-processor AMD, the list of which, taking into account the release of new models significantly enlarged. In terms of formal specifications new FX-8370 is really very similar to its predecessor, FX-8350. Say the same testimony and diagnostic utility CPU-Z. In the first place you need to pay attention to the version of the processor core, which the new FX-8370 has remained exactly the same as that of the preceding two years ago Vishera processors. This means that the new processor is in fact only a slight acceleration of previous models, and anything other than a slightly higher frequency in turbo mode, it can not offer. Judging by the way behaved our sample FX-8370, the basic principles of the Turbo Core technology, the new product compared with the FX-8350 is also not changed. But operating voltages seem to have become a little different. At full load, all processor cores, when the clock frequency FX-8370 is set at around 4.0 GHz, its supply voltage is in the area of 1.2 V, which is about 0.05-0.1 In less stress working in similar conditions FX-8350. In turbo mode when under load is less than half the processor cores and processor generates too high electrical power, frequency FX-8370 can be increased up to 4.3 GHz with a simultaneous increase in voltage up to 1.39 V. And this is – even more than the maximum operating voltage in turbo mode FX-8350. Thus, the variation of stress in FX-8370 has become stronger than it was in previous processors. However, such details are unlikely to have some serious practical value. And if you are used to operate the processor in the nominal value, the transition from the FX-8350 on the FX-8370 will give almost anything, except, perhaps, a small savings in energy consumption. But wait, maybe a beginner will be able to offer some distinct advantages in the dispersal? Two years – quite a serious period in which the semiconductor process technology could seriously change the percentage yield of crystals and their quality characteristics. That is what we had hoped when we started experiments on overclocking AMD FX-8370. Previously, we were able to overclock the processor design Vishera without any special extreme cooling methods to 4.7-4.9 GHz. The appearance of new items to reawaken hope for the possibility of a system with a 5-GHz processor capable of stable daily work. To conquer this psychologically important milestone we have decided to use liquid cooling maintenance free Corsair Hydro Series H110, which is able to dissipate heat more efficiently most air coolers. Processors Vishera, produced on 32-nm technology, always demonstrated linear behavior during acceleration. The whole procedure of overclocking consisted of a few simple steps. It was enough to raise the voltage to 1.4-1.55 V (depending on the performance of the existing cooling system) and include Loadline Calibration. After that, do not forget to turn off Turbo Core technology and function APM Master, the user can freely raise the multiplication factor. But caught in our laboratory AMD FX-8370 was a copy of a very capricious character. It turned out that he really does not tolerate voltage increase – its temperature quickly out of range, even at relatively low voltage levels. Already when installing the processor in 1,425 we are faced with overheating and throttling, which occurred at high load created by the utility LinX 0.6.5 with support for AVX and FMA-instructions. And this despite the fact that the processors FX-8350, visited earlier in our laboratory, it was possible to overclock without any problems raising their voltage up to 1.5-1.55 V. To be honest, there was even a suggestion that AMD will be like Intel, changed the processor is under the lid thermal interface, which led to a stronger than before, modern heating FX-8370. However, even with a small increase in the voltage to 1.4 V, FX-8370 has demonstrated the ability unexpectedly stable operation at relatively good frequency. Pyatigigagertsevuyu bar he certainly did not take, but the operation for a typical 125-watt members of the family Vishera 4.7 GHz problem for him was gone. In other words, the copy of the FX-8370, which we received on the tests, in terms of frequency potential was similar to past flagship, FX-8350. However, the conditions under which this is achieved by the frequency change. Now a serious increase in the supply voltage is not required, and 4.7 GHz is quite affordable with excess voltage is only 0.1 V relative to the nominal. The only pity is that the more serious attempts to raise the voltage remained unsuccessful – our FX-8370 in selecting the voltage 1.425 In cool, even at the nominal frequency, despite the use of the test system productive liquid cooler. It turns out, the new FX-8370 is ill-suited for the construction of overclocking systems where the processor operates at frequencies capture the imagination. We have achieved 4.7 GHz – it’s even better than the rated speed 220-watt flagship FX-9590. So if you are seriously aiming to conquer the 5-GHz mark, the acquisition will be a much better FX-9370 and FX-9590. For such “elite” of the AMD selects the most successful semiconductor crystals, and on average they are accelerated noticeably better than FX-8370 and FX-8350.